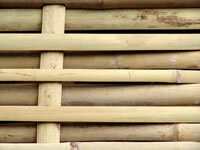 Bamboo fence panels add a unique and tropical look to your garden like nothing else! Our forests are rapidly declining across the world and this is the plant to use as an alternative to timber. Using bamboos for fencing instead of wood is another way to help reduce the deforestation of our irreplaceable woodlands. They are available in a wide variety of sizes and designs. 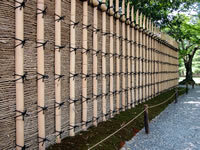 Some are constructed completely out of bamboo and others are designed with wooden frames. An example of what is available is; partial and/or full privacy fences, low garden edging, the traditional Japanese fencing panel, and rolled fence panels for flexibility. Prefabricated fencing sections and screens offer time savings. Ready built and delivered directly to your home or business. They are just like wooden fencing; they age and fade, and last for years. Expect to provide the same level of care and maintenance as you would provide to protect and maintain a wooden fence. It is recommended to use preservatives for maintaining your fencing quality such as; petroleum base preservatives, and oils such as hemp. On investigation it costs less and is more convenient to buy fence panels already made rather than trying to make your own. 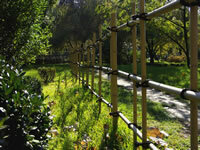 It's not easy to make your own bamboo fencing and will take a long time. When you weigh up the cost plus the hours you would put into making them yourself it hardly seems worth it. You would also have to have experience of building fencing products really otherwise you may end up with a weak fence that would blow down in the first gale! If you like doing DIY (do it yourself) and want to build your own bamboo fence panels, you should consider rolled fences with caps and mouldings. Portable screens are also a good consideration for DIY fence building.